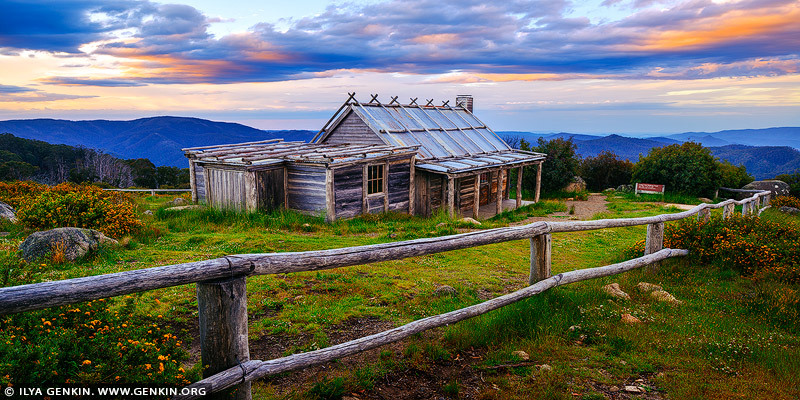 Craig's Hut near Mt Stirling, Victoria is considered as one of 100 Best Views In Australia. Drive up towards Mt Buller from Mansfield, then take a left after the Mirimbah tollgate onto Stirling Road. Then it's 8km of sealed road to Telephone Box Junction, the limit for vehicles in winter. But in the warmer months you can continue to the gravel by 2WD Circuit Road: turn left and drive for 20km to the junction with Clear Hills Track. From there it's a 20-minute walk or short 4WD drive to Craig's Hut. The spectacular, minimally developed Mt Stirling attracts cross-country skiers, horse riders and bushwalkers. The original Craig's Hut, inspired by those used by cattle drovers for temporary shelter, was built for the movie The Man from Snowy River (1982) but burnt down in a bushfire. This replica - with a tin rather than bark roof - was completed in 2008. This image belongs to the travel and nature stock photo library. This stock photo of Craig's Hut at Twilight is available for licensing for commercial and editorial uses including websites, blogs, books, magazines, brochures and advertising. Restrictions may apply for images which contain third party copyrighted material or sensitive subjects. Photos of artwork are for editorial use only. This image id AU-MANSFIELD-CRAIGS-HUT-0004 of Craig's Hut at Twilight, is copyrighted © by Ilya Genkin. This is not a public domain image.